“Your life and my life flow into each other as wave flows into wave, and unless there is peace and joy and freedom for you, there can be no real peace or joy or freedom for me.” Frederick Buechner in The Magnificent Defeat (1966). Ed Christman in 1991, age 61. Photo by Susan Mullally. 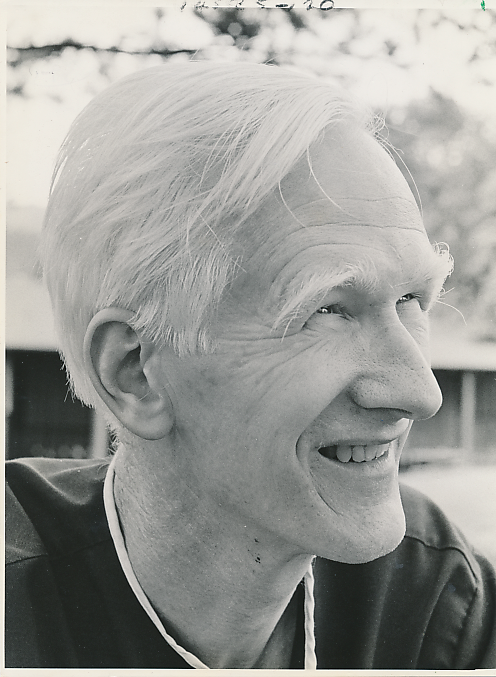 Ed Christman nurtured religious spirituality at Wake Forest. 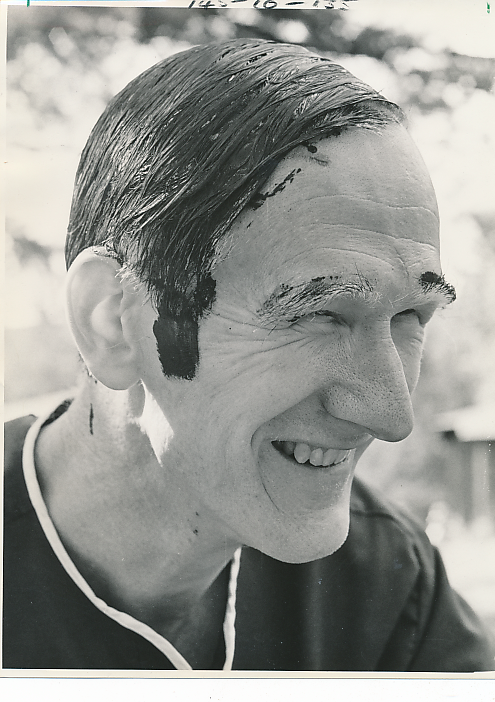 His spiritual leadership took several forms: commitment to the overall program of Campus Ministry; support for the Baptist Student Union and other student denominational organizations; organization of Preschool Conference, weekly Chapel, the Moravian Lovefeast, and other religious services and events; and advocacy for Volunteer Service Corp and other programs that put faith into action. “The New York Times list of needy families should include those persons with shirts and shoes but whose hearts ache — alone without any family, families broken by discord, those who hear the unmelodic sounds of prison doors, doors closed to older persons who cannot find work — people who wish that Christmas holidays would soon end and we no longer have to try and be joyous. “Recently, I said “Merry Christmas” to a person who may spend the Yuletide in jail. How absurd, on reflection, but I’m given to the ridiculous at times. “This is a time of birth, light, and even hope, and nothing I’ve said dissolves Christian affirmations in a sea of heartache. These references and ones others could make are worthy of more than the Liberty Bowl’s halftime references to religious freedom which included Santa Claus and hanging of stockings! “Our religious freedom is in the ability to accep that we all need affection, and each of us has some opportunity to shed love on others, regardless of whether it heals the ache inside. We have the freedom to laugh and cry with Dylan Thomas’ A Child’s Christmas in Wales performed by the National Theater of the Deaf. Indeed, these actors relying upon non-spoken communication speak truthfully to the gestures we give and receive ere we love our way in this world of woe. “Into a ‘creation which groans in travail waiting…,’ God comes like a small boy with his bucket filled at the well, headed for the house, spilling graciously the contents on the unsuspecting earth. He asked questions of Wake Forest itself. His view of the chaplain’s role — to question the university — was shaped by his study at Union Seminary in the early 1960s, including introduction to the Danforth study of campus ministry. The Danforth approach described campus ministers as being prophetic as well as pastoral and priestly. The fluency of his message and his iconic status on campus may have made it easier for him to be bold and encourage this in others. Paired with this, however, was his tireless work to advance a religious presence on campus. Amy Long ’06, MD ’10: Ed was a loyal supporter of Living Parables, the WFU Christian Drama Troupe, and we loved having him as part of our fan base. He told me shortly before I graduated: “Amy, You are a Living Parable.” I brushed it off, and then he said again, “No, Amy your life is a Living Parable.” I think perhaps that really describes Ed better than anything else. A Living Parable, a tangible beautiful story of grace, faith and commitment to empowering and disciplining the next generation. So grateful to have sat at his feet and listened to his story. Ed also brought his own experiences as a chaplain forward and questioned the established church and its leaders. For Baptists in this South, this meant Billy Graham. And in the early 1970s the question was about the Vietnam War. Richard McBride: Ed and I revealed to one another that each of us, independently, had written Billy Graham, imploring him to come out against the VN war. So, Ed said, “Let’s go visit him.” It took about a year to schedule an ‘audience’ with Billy. I drove us up to Montreat. We were welcomed warmly and sat down in his office. I was mostly an observer to the conversation that ensued. It was as if they were tossing snowballs at each other, with neither landing a hit. Building a Campus Ministry — a group of several denominational and organizational leaders engaged with spirituality — was an important goal for Ed throughout his career. He felt that Wake Forest should nurture the spiritual growth of its students and recognized, especially after the move to Winston-Salem, that the diversity of the Wake Forest community required a diversity of spiritual leaders on campus. The Presbyterian and Methodist denominations were the first to support part-time and later full-time campus minister. Episcopalians and Catholics followed. 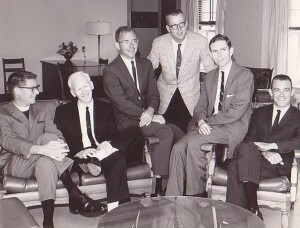 This group, with the addition of some local pastors, formed the core of campus ministry during the 1970s and early 1980s. By 1994, campus ministry had grown to include representatives of eleven organizations. In 2011, were 22 campus ministers plus University Chaplain Tim Auman, himself a former campus minister. “Campus Ministry seeks to be salt and leaven affecting the lives of individuals and the decisions of the school. We would hope that our presence invites people to heed God’s call to discipleship. Campus Ministry hopes Christian commitment is seen as a live option among the ultimate choices all of us make as human beings. “Residence life programs, counseling, health care, and other student services can be provided without reference to belief in God. By contrast, Campus Ministry assumes that worshiping and serving God are essential for the ultimate fulfillment of human life; this assumption is primarily a matter of faith, not of reason. The collaboration found in Campus Ministry has been expressed in many ways, such as through the annual preschool conference, a lively chapel series, a variety of special events, and a shared commitment that religious life at Wake Forest matters, for the students, for the community, and for the institution. Ed and Jean were members of the Baptist Student Union (BSU) as students at Wake Forest. Ed’s first job at the College, back in 1954, was as part-time Director of the BSU. As Assistant Chaplain, Ed was its sponsor. Through the years as University Chaplain and into retirement, Ed and Jean always felt a special bond to the BSU organization and to the student members. This continued after their move to Salemtowne. For most of Wake Forest’s history, students were required to attend Chapel services each week. When Ed and Jean were undergraduates in the late 1940s and early 1950s, students attended three services a week. Later chapel became twice a week, and then, by the 1960s, just once per week. 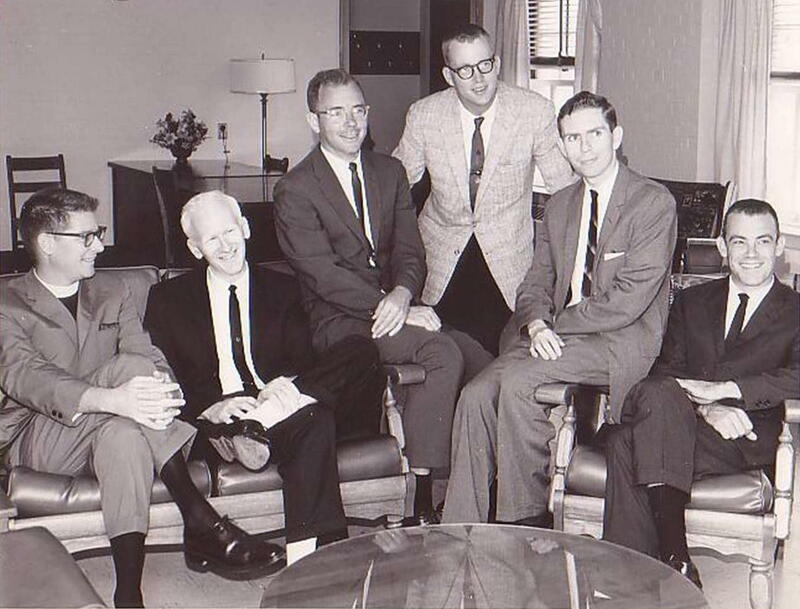 In 1969, under new President James Ralph Scales, Chapel became completely voluntary. The service was held each Thursday at 11am in the Davis Chapel. Ed, as Chaplain, was responsible for organizing approximately 30 weekly chapel programs per year, including a speaker, music, and prayer. Chapel speakers were an eclectic mix. In any one school year, attendees would be rewarded with messages from fellow students; campus ministers, faculty and administrators; pastors from the “neighborhood” of Winston-Salem; religious leaders from across North Carolina and the nation. Ed especially enjoyed inviting alumni who were having interesting experiences as pastors, teachers, chaplains, or international missionaries. He was able to preserve Thursday at 11am as a time dedicated to Chapel, with no classes to be scheduled, so that any student be able to attend. One of Wake Forest University’s signature events is its annual Moravian Lovefeast held the first Sunday in December. 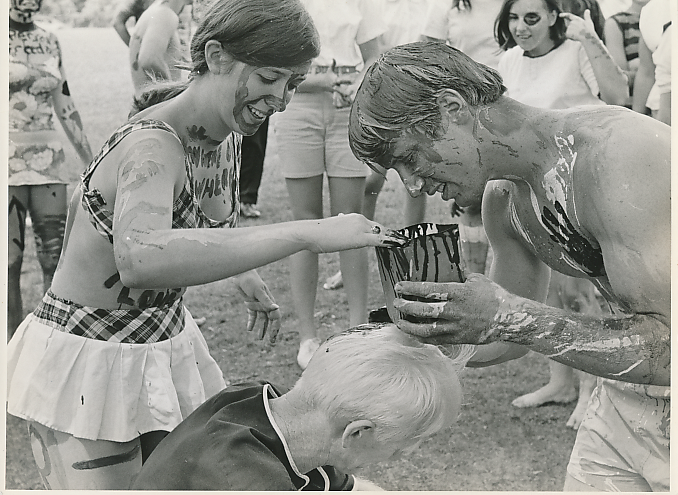 The first Wake Forest Lovefeast was held in 1965, at the suggestion of Jane Sherrill Stroupe ’67, a Moravian student. It was held in Davis Chapel and the New Philadelphia Band provided the music. The campus fell in love with the Lovefeast right away, and it soon moved to Wait Chapel. Ed organized and hosted this event, along with his fellow campus ministers. In the early years, then-secretary Jean Holcomb and many students wrapped beeswax candles in the Moravian style of red crepe, and when the service grew large, candles were purchased. Gayle Hartgrove, Ed’s administrative assistant beginning in the 1990s, took over many of the organizational responsibilities. Each year, a group of students, faculty, and staff would be invited to participate as ‘dieners’ to serve the simple meal of bun and coffee. Music was invited from campus groups such as the handbell choir and the gospel choir. At the suggestion of Professor Howell Smith, the Lovefeast began to collect cash donations for Crisis Control Ministry, Samaritan Inn, and other Winston-Salem service agencies. Each year the attendance increased, peaking in 1988, when there were 2,400 people — more than the fire code would allow. Attendance has averaged 2,000 since then, and the Lovefeast remains the favorite holiday activity for the Wake Forest community. Wake Forest’s big stage and its commitment to the Moravian Lovefeast has made this the largest such celebration in North America and likely one of the largest in the world. In 2014, when the Wake Forest Lovefeast turned 50, the University live-streamed the event from the website and it was seen around the US and in a few other countries. 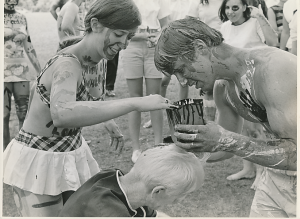 The Lovefeast remains one of the most beloved and religious of the University’s annual events. Shortly after the move, Preschool Conference gained its permanent home at Camp Hanes, in Stokes County, about 30 minutes from the campus. Its permanent calendar date was the week before school started, and all freshman as well as returning students were invited. It started small but over the years became a bigger and bigger production of creativity, synergy and logistics. Preschool Conference alumni will remember the gatherings of students, faculty, and administrators, with a few outside speakers, at a beautiful rustic setting for a few days to explore faith, intellect, new directions and journeys, and build community spirit for the year to come. Also, to play tricks, listen to music, watch a fire burn, meet new friends, and consider a different view of one’s self. “The most startling composition was a study in black and white entitled Ed Christman, Chaplain. Christman, just back from a year of doctoral study at Union Theological Seminary in New York, watched the students paint their hair stop-and-go colors, laughed at the sayings printed down legs, on arms, and across backs: Body by Fisher, No Leg to Stand On and WFU Naval Academy. At Preschool Retreat, there was often transformation to a new view of self and others. Such it was the year that Ed has his hair painted black. During the 1990-91 school year, the university administration floated the idea of a mandatory orientation program for all students. This program would have eliminated the time window for the Preschool Conference, and its eclectic and spiritually rich elements would have been lost. The proposal did not gain support and was withdrawn. The Volunteer Service Corps (VSC) was formed in 1989 as a project of the Chaplain’s office. It was inspired by student interest and funded by an alumni bequest. 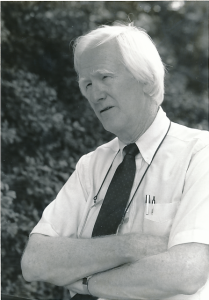 Ed Christman partnered with alumnus Henry Cooper (’54) and with a group of students, including Libbey Bell, Matt Rubello, Mary Beth Torbett and others, to create the VSC in 1989. The VSC program was designed to provide the structure and opportunities that would encourage a deeper commitment to service among students, faculty, and staff. Of Ed’s many accomplishments, the co-founding of VSC is at the top of his list. The VSC was part of the Chaplain’s office, and its budget, in its early years. The University was then able to seek grant funding for a paid position and an expansion of the program. By 1990, Henry Cooper reported that 670 students were involved. In 1993, the VSC become part of the Student Development Office. Henry Cooper’s pivotal role as the first director is celebrated in the Henry Cooper Service Award, which is given to the WFU graduate who best exemplifies a commitment to service. The Volunteer Service Corps celebrated its 10th reunion in October 1999. Pictured are Henry Cooper, Ed Christman, and Paige Wilbanks, Director. Photo courtesy of Henry Cooper. The care of Wake Forest University’s Wait Chapel falls under the responsibility of the University Chaplain. The Chaplain and Administrative Assistant oversee the use of the Chapel. This includes scheduling University events (mostly non-religious), numerous weddings and other private functions, and working with the Wake Forest Baptist Church, which has Wait Chapel as its congregational home. By the accident of geography and due to limitations of space, during Ed’s tenure, the Chaplain’s office in Wingate Hall was also used as a dressing room and studio for speakers and performers getting ready for an event. It gave them easy access to the stage door. Sometimes Ed, with family and friends, would have the opportunity to meet luminaries such as Bill Cosby and Bill Moyers, back stage in his office home. Throughout Ed and Jean’s years at Wake Forest, the Wake Forest Baptist Church on the campus has been their congregational home.The original Wake Forest Baptist Church was the site of Ed’s baptism and Ed and Jean’s wedding. The Winston-Salem congregation, still on the campus, has been their spiritual community since 1956. Its progressive and bold spirituality reflected the Christmans’ own philosophy. “The class is designed to bring together college students and non-students, WFU faculty and staff, townspeople, and friends. The Shields, the Sinals, Bryans, Shepherds, Wests and Mills (who drive down from Madison) have been the regulars over the years along with a faithful group of five or six students. “The class focuses on biblical study as a basis of informing (and possibly shaping) our lives today. This fall, for example, we are reading and discussing the Book of Acts in an attempt to (1) to try to understand it more fully and (2) to see how it relates to, and informs, the life of the church today. The class format is variable, with Ed sometimes leading us, or providing background, but mostly with Ed engaging us in discussion, challenging us to express our viewpoints and questions about the Biblical material being read and its relevance to our personal lives and the church. “But that just tells you what we do. It doesn’t tell you what the class is really about, what it means to us. … For me, the class is a group of friends, friends who like each other and share with each other. We even socialize together, take trips out of town together or make up various excuses to get together and share a meal. Friends who are honest and frank with one another, who can share our doubts and uncertainties about our faith, because our leader is first and foremost honest and forthright about his faith, beliefs, and shortcomings. “The class is a place where we are all encouraged to ask questions, share our points of view, where there are no wrong answers. Ed encourages us all to think and reveal, but mostly he simply encourages us. “Also, the class is Ed’s stage. Like most of us who teach, Ed is really an actor at heart. In his case, he has actually had the courage to act on stage (the WFU stage), but when such opportunities do not exist, the classroom is the next best thing. And in his dramatic outbursts, Ed brings the biblical stories alive, gives us his interpretation, his rendition of the story we are reading and trying to understand. He’s loud, boisterous, quiet, sensitive, and always passionate. You may not agree with his version of the story, but you have to admit it comes alive: it’s a compelling way to look at it. “And of course, Ed has a plant in the class, his wife Jean. If none of the rest of us have a clue as to the answer he wants, he calls on Jean. They repeatedly maintain they never rehearse class situations ahead of time, but some of us are not so sure. 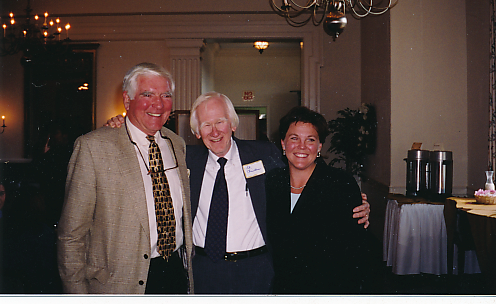 “Lastly, I would be remiss if I didn’t say a few words about Ed as a person, a friend, and a colleague, or as a person connected or not connected with the Sunday School class. Or maybe you cannot disconnect him from the class, from the church. “Anyway, for Sue and me, Ed has always been there when we need him, in our times of crisis, sadness, or celebration. … When one of us is in the hospital, Ed’s always the first one to visit us. When we need to discuss coaching strategies for the WFU basketball team, Ed’s there to participate. And when you need an introduction to the world of cardiac rehab, Ed’s there again to ease you into the group. For more on the church and its link with Ed’s own work, see the Biography / Chronology section titled Ed in Seminary and Ordained to the Ministry.